A favorite cocktail here at InAbsinthia is the "Corpse Reviver #2". Yes, that's "#2", to distinguish it from the nearly forgotten "#1". It is one of the few cocktails we actually enjoy using our precious absinthe in and it really tastes great, as well as being easy to make. Just put in equal parts gin, Cointreau, Lillet Blanc and lemon juice over ice in a shaker, add a splash of a good absinthe and shake well. Pour into a frosted cocktail glass and you have one of the Top 100 Cocktails of all time. But leave it to the folks at North Shore Distillery, makers of one of our favorite US absinthes, SirÃ¨ne, to actually think of bottling this magical formula. But sure enough, they are coming out with "limited release" of a premixed corpse reviver! Now all we have to do is figure out a way to get our hands on one of the precious few (only 515!) bottles! Staying true to the original cocktail, the first thing you will notice is a pleasant fresh citrus aroma. Then the melody of botanicals fill in underneath, providing a full, inviting bouquet. As you drink the spirit, you will taste a delightful combination of citrus and herbal notes with a nice balance of sweetness and tartness. No single flavor dominates. A symphony of flavors, with harmonious complexity. To enjoy this wonderful spirit, simple shake it with ice, and strain into a cocktail (martini) glass. The traditional garnish is a single cocktail cherry placed in the drink. A rather lukewarm defense of absinthe, desribing its arc as it went meteorically from illegal to faddish to "out". What, with comments like " Iâ€™m not a huge fan of the spirit by itself, or in the preparation of dripping water over the sugar cube", it's hardly something we like to read here at In Absinthia. 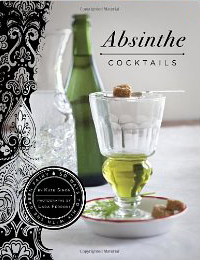 But it is a nice synopsis of absinthe in the popular culture of now. 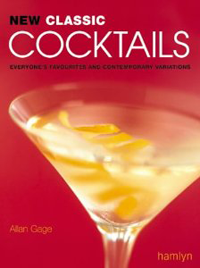 He recommends it in cocktails, which we often eschew. Of course, we do like absinthe's "bitter-licorice-anise-fennel flavor profile", even if, again, we don't find it a particularly accurate description. We think overlooked is the complexity of absinthe's taste and the wide, almost limitless, variety of mixtures, bringing the exploration of absinthe more in the realm of wine tastings than any other liquor. So in a way, we are looking forward to absinthe moving past the "fad" stage and just to where people can enjoy it without trying to look hip. 100 Mil? ">Brother, Can You Spare $100 Mil? One of Pablo Picasso's most famous paintings, "Portrait of Angel Fernandez de Soto (The Absinthe Drinker)," will be offered up for auction by Christie's in June, with a starting bid of US$40-$60 million. 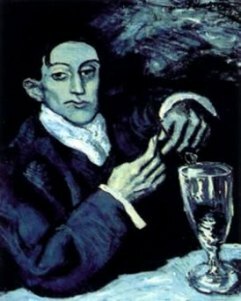 It features de Soto sitting before his absinthe glass, and was painted by Picasso in 1903 during his "blue period". The painting is owned by Andrew Lloyd Weber and the proceeds will go to his charitable organization. The early guessing is that it will approach or even exceed the previous art auction top bid of $104.3 million for a Giacometti sculpture. Sure would look good hanging up in Chez InAbsinthia's massive art gallery. Maybe we should add a Donate button? National Absinthe Day almost over! Almost missed it folks! 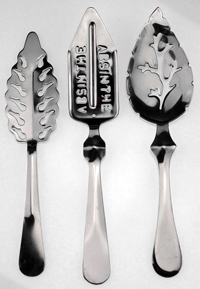 Viridian Spirits wants to declare March 5th as National Absinthe Day - and we're alright with that here. It was two years ago today that the US Government came to its senses and allowed absinthe back on the shelves after a long 95 years. May the louche flow freely! Not counting St. Patrick's Day, March is pretty much devoid of holidays. 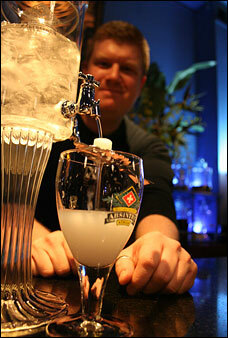 But if absinthe maker Lucid has its way, March 5 will henceforth be known as National Absinthe Day. It was on that date in 2007 that the U.S. government finally gave in and made the libation legal here after about a 95-year ban. Oh boy, now the totally ridiculous French (and nearly worldwide) absinthe ban of the early 1900s is used to defend the (ahem) "War on Drugs". This is a letter to the editor in the Pittsburgh Tribune-Review. And yes, as a matter of fact, the French did prohibit absinthe for nothing, merely a hysterical overreaction, fed by the wine lobby, to bad publicity. Funny he should say that now. Wonder if Mr. Casey realizes it is now legal in France and nearly everywhere else, and that he can probably buy a bottle at his local liquor store? Amesh A. Adalja ("End the drug war," Letters, March 4 and PghTrib.com) seems to believe that allowing the legal use of drugs will stop the violence by Mexican drug gangs from spilling over into the United States. It may, but free access to drugs by the public will bring on consequences too serious to contemplate. The French didn't prohibit the unrestricted sale of absinthe for nothing. It endangered the well-being of the whole nation. The big news in the absinthe world last week was the thrilling announcement that Viridian, makers of Lucid, one of the first absinthes back on the US market, is going to import two very prominent labels beginning this fall. 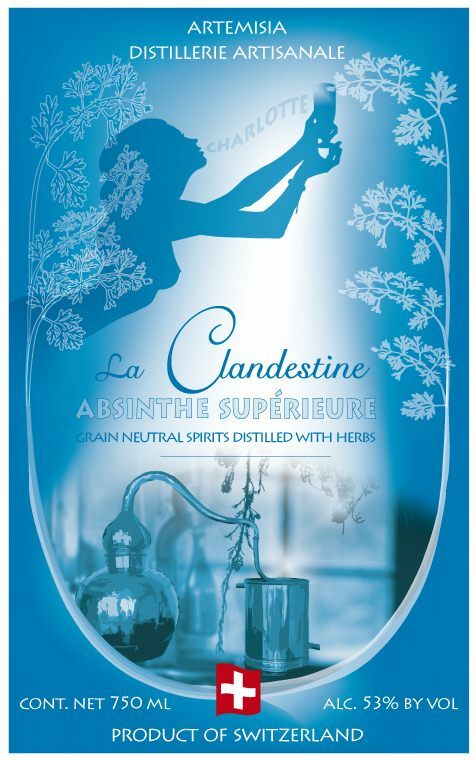 Alan Moss, who we interviewed earlier, has a very nice blog post listing upcoming labels and, at the end of the post, reveals that La Clandestine, the Suisse Bleu absinthe he promotes, is coming to America finally! And he also mentions at the very end the inclusion of Nouvelle-OrlÃ©ans, from Ted Breaux's Jade Liqueurs to Viridian's stable of imported absinthes. Both of these have great reputations as absinthes and we can personally attest to the wondrous Nouvelle-OrlÃ©ans and have had La Clandestine next on our list of absinthes to purchase. Looks like soon we will be able to get it locally and avoid the stiff shipping charges! David Nathan-Maister, the absinthe connoisseur extraordinaire, also known as OxygÃ©nÃ©e and proprietor of the amazing Virtual Absinthe Museum, is offering up a taste of something extraordinarily rare - some pre-ban absinthe. Yes, we're talking about real absinthe dating from the 1880s, freshly decanted from the original bottles. You buy it in small and stunningly expensive amounts- like US$300 for 30ml (or about two small tasting glasses). But even so, these go fast. When we hit the lottery and retire to our French seaside villa, we will stock up on all of his fancy offerings! If any of you actually do grab one of these, please feel free to post a tasting here on In Absinthia. We will just have to live vicariously at these rates. An extraordinarily early Swiss bottle, likely the oldest intact Swiss absinthe to have survived. Found alongside the Edouard Pernod bottle shown above in the same cellar bin. The distiller, J.V.&Ca were based in the canton of Neuchatel (here rendered in the archaic spelling "Neufchatel"), just inside the Swiss border in the area where it is demarcated by the river Doubs. This is an exceptional bottle. The branch of Edouard Pernod in Lunel was sold off and changed its name to Gempp Pernod in 1880, so this bottle can be dated with confidence to prior to that date. It's the earliest intact sealed absinthe bottle yet unearthed.